Contemporary Medicine Associates congratulates Bo Allaire, MD on being named a Houston Top Doc! Dr. Allaire is the Chief Medical Officer of Contemporary Medicine Associates (CMA). He is board-certified in both family medicine and addiction medicine and specializes in the diagnosis and treatment of substance use disorders. CMA’s doctors, nurses and mental health professionals compassionately provide medical and mental health services to patients struggling with or in recovery from addiction or other psychiatric disorders. 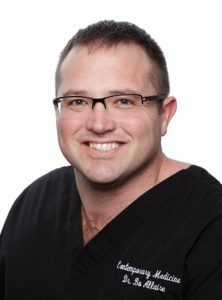 Dr. Allaire lives in Richmond, Texas with his wife Lauren, their two sons Ethan and Luke and their English bulldog Molly.